Above is the John Aislabie, Chancellor of the Exchequer from 20 March 1718 – 23 January 1721. Aislabie was elected as a Member of Parliament for Ripon in 1695, apparently on the assumption he was a Tory, though his political views were somewhat fluid. He became more active in politics from 1704, especially on the economy. He eventually became associated with the Country Whigs. Under the patronage of Robert Harley he was appointed a Lord of the Admiralty from 1710 in the Tory administration. This proved a precarious appointment as Aislabie’s Whig sympathies manifested in votes against the government. When the Whigs returned to office in 1714, Aislabie was made Treasurer of the Navy. He became an ally of the Earl of Sunderland who became, in effect, Prime Minister in 1718. Sunderland appointed Aislabie as Chancellor of the Exchequer. 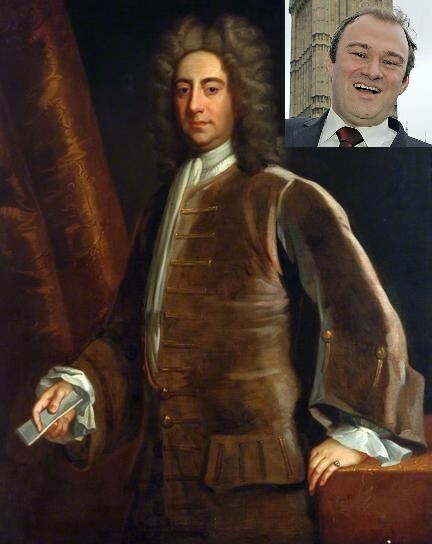 When in 1719 the South Sea Company proposed a deal whereby it would take over the national debt in exchange for government bonds, Aislabie was a very strong supporter of the scheme and negotiated the contract; he piloted the Bill through the House of Commons. The South Sea Company had been built on high expectations which it could never fulfil, and it collapsed in August 1720. An investigation by Parliament found that Aislabie had been given £20,000 of company stock in exchange for his promotion of the scheme. He resigned the Exchequer in January 1721, and in March was found guilty by the Commons of the “most notorious, dangerous and infamous corruption”. He was expelled from the House, removed from the Privy Council, and imprisoned in the Tower of London. The man in the top right hand corner of course is the utterly inconsequential Mr Davy, the Member of Parliament for Kingston and Surbiton and Secretary of State for Energy and Climate Change. The costs of Russia’s gas has been rising and the generators are now using coal. At times during the past fortnight coal has generated 40 per cent plus of the UK’s power. At the same time the UK’s wind turbines contributed around 0.2 per cent. OK then you say: So the country is saving some money. What this means is this: come a cold winter in a couple of years time and there will be power cuts. Old people will die of hypothermia in their homes. Not because they cannot afford to heat their homes – many of course will not be able to – but due to the power being off. Of course the economic effects of the country ending up like a third world African country in having to adopt a rota of cuts (Nottingham will have electricity on Monday, Wednesday, Friday and Leicester will have electricity on Tuesday, Thursday and Saturday) will be catastrophic for international investors will henceforth regard the country as unfit for investment. This of course will mean that the rating agencies will down rate the country’s credit rating to junk – whatever the state of the public finances. It has been suggested that this may be part of a “green agenda” to engineer a shortage to enable high prices to be charged for “Green Energy.” If so, not only are these characters playing with fire, they are playing with people’s lives. It is however the opinion of the British Gazette that far from being a scheming monster, such as Mr Davy is merely a well meaning but naïve, incompetent buffoon. As evidence (of Davy’s buffoonry) we would put forward as evidence the cut to the Police forces across the country and the latest cuts to the British Army. This is because any collection of sane conspirators would make sure that they had sufficient numbers of police and troops as a backup to deal with the inevitable civil commotion and riots that will ensue as a direct result of their actions. The fact that they have not enacted these most basic of things shows that these characters are utter nincompoops.